Apple on Friday posted its preliminary proxy statement with the U.S. Securities and Exchange Commission, which included, among other operating necessities, details of a $50 billion stock repurchase proposal submitted by Carl Icahn. With its preliminary proxy filing, Apple covered the goings on of 2013 and outlined its plan for the upcoming 2014 fiscal year. While much of the preliminary proxy is comprised of standard information to satisfy shareholder and SEC requirements, a few bits of data are of particular interest to those following Apple's operations. As per usual, proposals up for shareholder vote are among the most contentious issues in the statement. Of particular interest is Proposal No. 10 for a "Non-Binding Advisory Resolution Relating to the Company's Capital Return Program," which involves billionaire investor Carl Icahn's push to return additional cash to AAPL shareholders by picking up the pace of its stock repurchase program to $50 billion by the end of fiscal 2014. "RESOLVED, that the shareholders hereby approve, on an advisory basis, High River's proposal that Apple commit to completing not less than $50 billion of share repurchases during Apple's fiscal year ending September 27, 2014 (and increase the amount authorized for share repurchases under its Capital Return Program accordingly)." In October, Icahn said he would consider bringing the $50 billion proxy vote up during Apple's Annual Meeting, which would force Apple executives to buy back more of their own shares. Icahn offiically filed the proposal in December, saying "Apple is not a bank" in reference to the company's gigantic overseas cash hoard. At the end of the fourth quarter of Apple's fiscal 2013, the company held $148.6 billion in cash, $35.5 billion of which was held domestically. At the time, there were no plans to repatriate any portion of the cash pile. 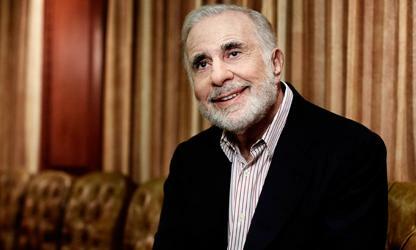 Icahn revealed in October that he had at the time 4.7 million shares of AAPL stock, up from a previous total of 4 million. That would give him nearly $2.7 billion stake in the company at its current value. For its part, Apple recommends a vote against the proposal, saying "The Board and management team are thoughtfully considering options for returning additional cash to shareholders and are currently seeking input from shareholders as part of the Company's regular review." According to the proxy statement, Apple will complete a regular review and analysis of the issue and announce any changes to the current program by March or April of next year. Apple spent a combined $43 billion on dividends and share repurchases over the program's first six quarters. Apple notes that, while against this particular repurchase plan, it is "fully committed to returning cash to shareholders." The board of directors and upper management believe any such returns should be conducted on an "efficient and sustained" basis that considers the long-term interests of the company and shareholders. Apple's existing plan, which is already in action, is to buy back $100 billion worth of stock through 2015 and dish out dividend payouts to shareholders. In addition to the proposals up for vote, Apple's preliminary proxy offered a look at the previous year's operating expenses, including a peek at executive salaries. Apple CEO Tim Cook was paid a total of $4.25 million for 2013, not including restricted stock units scheduled to vest at a later date. Other top executives like CFO Peter Oppenheimer, SVP of Internet Software and Services Eddy Cue, and SVP of Hardware Engineering Dan Riccio all received salaries of about $2.6 million. Apple's shareholders meeting will take place on Feb. 28 at the company's headquarters in Cupertino, Calif.